If you're interested in a cost effective method of increasing your supercharger's output as well as improving reliability, look no further. A cooler and denser air / fuel mixture takes up less space inside the combustion chamber, allowing for higher efficiency and more power without the risk of detonation. 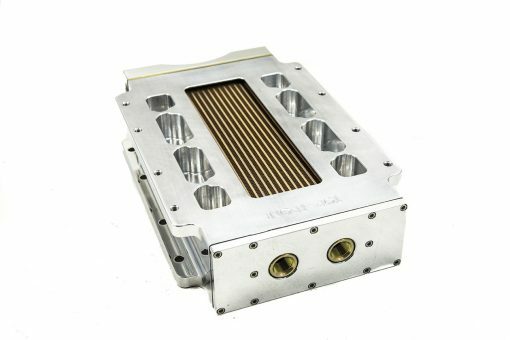 The Blower Shop's Intercooler was developed because of the screaming need to reduce intake temperatures in high performance marine power plants. To assure optimum performance and durability, TBS designed and built our system exclusively from billet aluminum, known for its strength over casting and it gave it a fin count of 16 per inch on the air side and 16 on the water side. After TBS coats the core with exclusive "Chromacoat" protective coating for added beauty and longevity, we pressure test it to 100 pounds per square inch. We then include a billet end tank with 2 integral 3/4" NPT fittings for added strength and increased water flow. 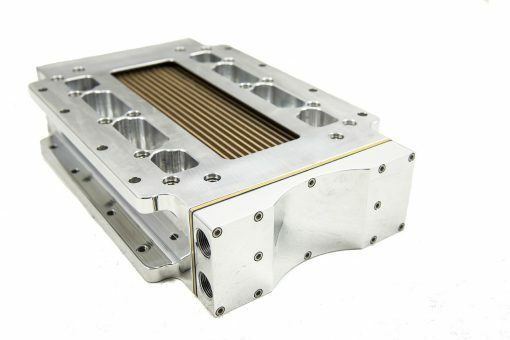 To test the cooling effectiveness of the TBS Intercooler, we built a 1050 horsepower, 497 cubic inch supercharged monster capable of running at 7,000 rpm. 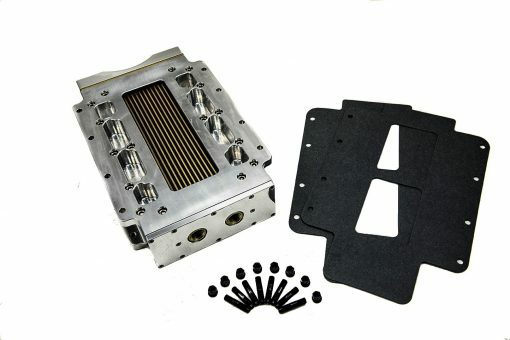 At 6000 rpm, without an intercooler, and 7.7lbs of boost, a baseline inlet temperature of 190 degrees was generated with 840 hp and 735 lb-ft of torque returned. At the same rpm, with 7.6lbs of boost below The Blower Shop's Intercooler, the inlet temperature dropped by 44% from 190 to 106 degrees. More significantly horsepower and torque both increased from 840 to 900 hp, and from 735 to 787 lb-ft torque. **Black hard anodizing is available at an extra charge. Please call (208) 985-7650 to for special orders and availability.